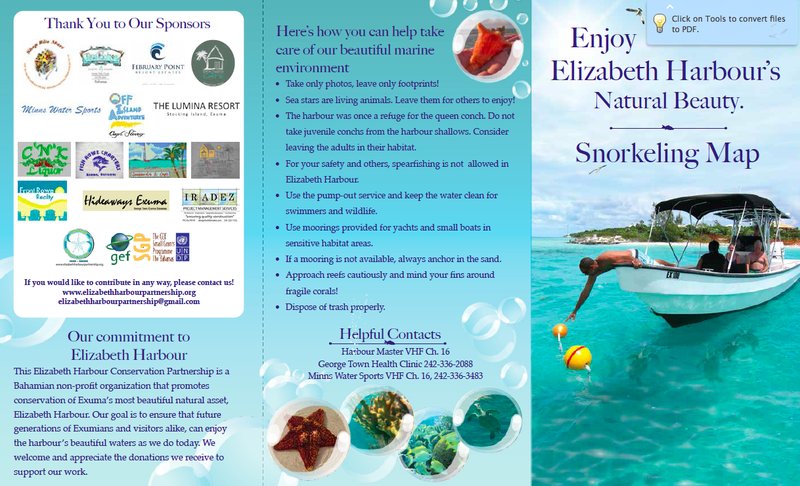 Like to snorkel but not sure where to go in Elizabeth Harbour? There are now snorkeling maps available that provide the locations of our new buoys at popular snorkeling spots in the area, and the things you will see in each spot. 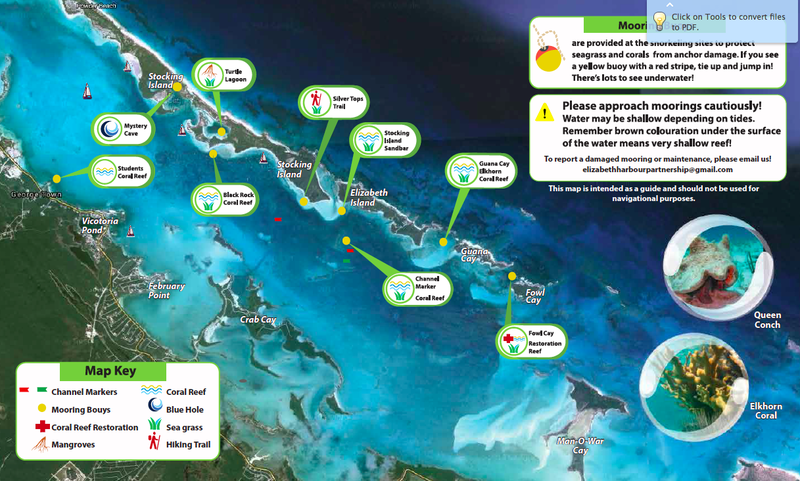 This map will soon be available at hotels, businesses and the Port and the Ministry of Tourism offices in George Town. If you can’t wait to get one, you can see a sneak peak of the printed version below. We’ve also created an online interactive version that will now be available and updated on this website. This map features the location and lots of info about each snorkeling site, and it shows the locations of the snorkeling mooring buoy sponsors, which have committed an annual donation in support of keeping the buoys maintained and the maps printed! We owe many thanks to those that have supported the Snorkeling Mooring Buoy Program. Please make sure to check out the program sponsors who donated time, funding, and materials to make it happen. The Elizabeth Harbour Conservation Partnership is dedicated to keeping Elizabeth Harbour the most beautiful in the region by engaging the community in our conservation efforts. P.S.! We would really like to get feedback from a wide variety of users (or potential users) of the mooring buoy program. Please take 60 seconds to fill out this online survey. You could win an EHCP t-shirt! This entry was posted in moorings, projects, Uncategorized and tagged moorings, projects, snorkeling. Bookmark the permalink.